I’ve always had a fascination, what would be to float through the air, to feel and hear the wind blowing your face, to embrace the height and feel mighty as you looked down on all the buildings, cars, people and the activities in a rather mundane way. When I was in school in Muscat, there used to be a coffee shop just outside that used to sell candies with a little toy in them. Some with paragliding soldiers, some with tiny helicopters that you could flick in the air and some selling foam gliders. As a kid these toys brought a lot of joy, but the one that’s always captured by attention was the paragliding soldier. I’m sure, if I run through my old stuff, I should find a couple of those brave dudes. Fast forward a couple decades and here I am at an adventure outlet, waiting to sign in for my first paragliding experience. I’ve seen strangers do it, I’ve seen my friends do it and finally I had convinced myself to take the leap of faith. 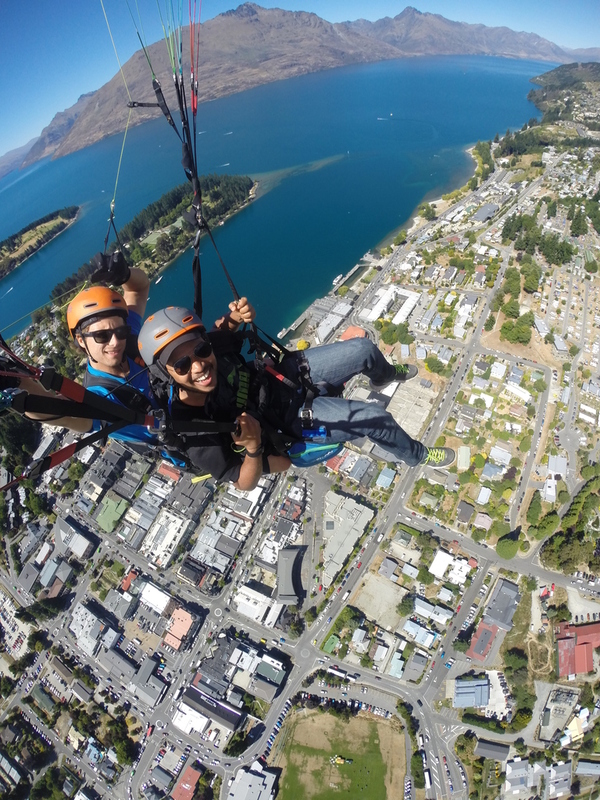 I was to jump from Coronet Peak, a 20 minute ride from downtown Queenstown. The morning of the jump and it was a lovely day, clear skies and the sun beating down, what a beautiful day for a jump atleast that’s what I thought, till I reached the jump office. Was this a bad sign?? “Sure, how about the next available slot” I said. I was re-scheduled to jump the next day. I woke up to a windy morning in Queenstown and didn’t have much hope for the jump and just like I feared, the jump was called off. Was this a bad omen?? A jump called off. I really wanted to tick this one off my bucketlist and it didn’t fall in my favour. As I was musing on stuff to do and my failed attempts, I was flipping through some brochures at the hostel reception and that’s when a walk in Paraglide ad popped up. 30 minutes later, a man with a heavy backpack and dark shades and held out a hand. I nodded and smiled at the little child inside me.The rest was history and I was crossing off a huge task from my bucketlist. The parachute is first unfurled and your instructor adjusts the strings as you nervously watch from the slopping cliff, your quickly bound into a full body harness. A little wait for the wind to pick up and blow out the para-chute. The instructions are simple but rather hard to follow. You would have to walk a bit and then stop, you do this a couple of times to stretch out the strings, once the strings and parachute are fully unfurled, you run as hard you can to the edge of the cliff till the point that there is no cliff……. Think you can leap or would you back away? Thanks…. take your leap of faith, we only live once.